To schedule an inspection, call 608.712.0421. Madison's Best Home Inspectors have experience in construction and remodeling, as well as general maintenance and repairs, so we have hands-on knowledge of how your home works and how it is supposed to run. You will be given an unbiased, detailed report on your home using Homegauge software. Your report will be emailed to you and your agent, with photos, usually in less than 24 hours. 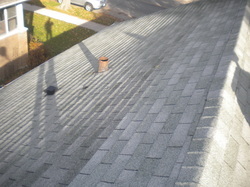 While not every roof is accessible due to weather or the condition or slope of the roof, every effort is made to inspect the roof and its components from the roof. Some inspectors do not go on the roof, period. Madison's Best Home Inspectors strictly abide by the National Association of Certified Home Inspectors (NACHI) code of ethics, and the State of Wisconsin Standards of Practice for Home Inspectors. Not every homebuyer is an expert in recognizing problems, or things that are just not quite right. We want to protect you and your family by identifying potential safety and health issues, as well as help to identify systems in the home that could fail prematurely. Buying a new home is an emotional event, and our job is to help you make the right decision.